The good news has been a long time coming, but, yes, there will be a 10th Annual Frank B. Shaner Hawaiian Falsetto Contest. True, Shaner is no longer doing the morning drive shift at a certain Hawaiian music radio station, and the contest has moved from the Hawaii Theatre downtown to the Sheraton Waikiki, but the contest is on, and Shaner promises a fine celebration of male falsetto singing when a field of 10 finalists takes the stage tomorrow night. Contest winners of years past will be honored, and seven will also perform together in "one huge medley" just before intermission. "They're each going to sing 30 seconds of their song, and then the next guy will segue into his winning song, and then the next guy, and then we'll end it with them picking me up on their shoulders and parading me around town with conch shells blowing," Shaner said, we think jokingly, at least the last part. Male falsetto singing is unique to the islands. Where Western-style falsetto singers try to make the transition between their lower and upper vocal registers as smooth and unobtrusive as possible. Hawaiian falsetto singers of both sexes emphasize the ha'i, or vocal break, for dramatic effect. 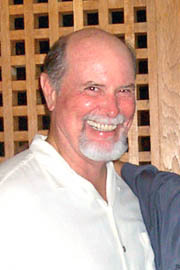 Shaner created his namesake contest back in 1995 after participating in the Clyde "Kindy" Sproat Falsetto and Storytelling Contest on the Big Island. His own contest has probably become the biggest competition of its kind in Hawaii. Singers from throughout the state, as well as the mainland and Japan, have taken part. Frank B. Shaner keeps falsetto alive. SHANER ACKNOWLEDGED that things were grim for him and the contest after he returned to work after a short vacation in January and was informed that his longtime morning radio gig had been terminated. "In the past years, I've been behind the microphone getting the word out, and this year with me not being there, it's (been) a little hurdle to get over. KINE is talking it up a little bit ... because the Sheraton bought $4,000 worth of air time, but the people who have been there for every one, that's our main support group. There's about a thousand of them that come out each year." Along with the help of friends at other media outlets that came forward to help him get the word out "and keep the fire lit," Shaner also credits Janet Hyrne, whom he describes as "the mainstay, the backbone really (of the contest)," and a loyal group of "about 30 ladies from Queen's Hospital who come out and volunteer every year." As well as Sheraton Hawaii, which welcomed the contest back to Waikiki eight years after Aloha Festivals executives moved it from the Royal Hawaiian Hotel to the Hawaii Theatre. Shaner's falsetto contest is one of the few events associated with the Aloha Festivals that helps raise money for its programs. "THIS WHOLE event is for the perpetuation of this type of unique singing to Hawaii," Shaner said. "You get people from all different walks (of life) this year -- policemen, clerks, the unemployed to the newly employed, even one guy from New Jersey. They're coming from all points. "This kid, (Cody) Pueo Pata from Maui (who won in 2000), he's really becoming somebody up there on that island and everywhere," Shaner says. This year, he'll be introducing a new falsetto star from the Valley Isle. "We're bringing out this young man from Maui, Kamaka Fernandez ... (who was) raised immersed in the Hawaiian language and culture. When this kid came out last year (at a Maui contest,) he just wailed. He is the Tiger Woods of falsetto, right there from Maui." As for Shaner himself, he hasn't remained idle. He said that, in addition to road-testing shopping carts in anticipation of becoming homeless, he's been spending time surfing with Andy Bumatai, working on a sequel to his Hoku Award-winning comedy album, "The Adventures of Leimomi," developing his talents as a painter, reading for roles on the television shows that are shooting here, and doing freelance emceeing and voiceover work. "I'm available for work at any time now. I can stay up late and actually have a life. Trying to get my new (identity) on is always quite interesting, this new 'skin' that I'm now growing. I'm trying to make a run to Japan with the falsetto crew to open up Japan with falsetto. There's a lot of hula halau and traditional Hawaiian music in Japan, but as far as that style of music is concerned, there's nothing really happening at this point. "All of these things that I've wanted to do, now I have the time."